Puerto Rican flags waved proudly along Fifth Avenue this past Sunday, June 10, 2018 at the 61st National Puerto Rican Day Parade. Despite the devastation that Puerto Rico has endured this past year, for many attendees (including myself) it was important to come together in solidarity and strength as a community. The parade which has traditionally been a celebration of our people, our culture, and our contributions to this country had a different purpose this year. Many of the floats and attendees used their voices and platforms to shed light on the ongoing recovery, rebuilding, and renewal efforts in Puerto Rico. It’s been nine months since Hurricane Maria wreaked havoc on the island destroying everything in its path. The island’s infrastructure, already shaky after years of neglect, was devastated. Almost a year later, there are almost 7, 000 homes and businesses still without power and thousands of displaced families trying to recover and rebuild what Maria destroyed. For many of us in the diaspora, when Hurricane Maria hit, we did all we could to help our people on the island. Whether it was through fundraising, collecting food, water, and medical supplies, or merely sharing information about survivors and connecting them with loved ones we all did what we could. Which was why it was important that our participation in this year’s parade reflected the ongoing plight of our people. 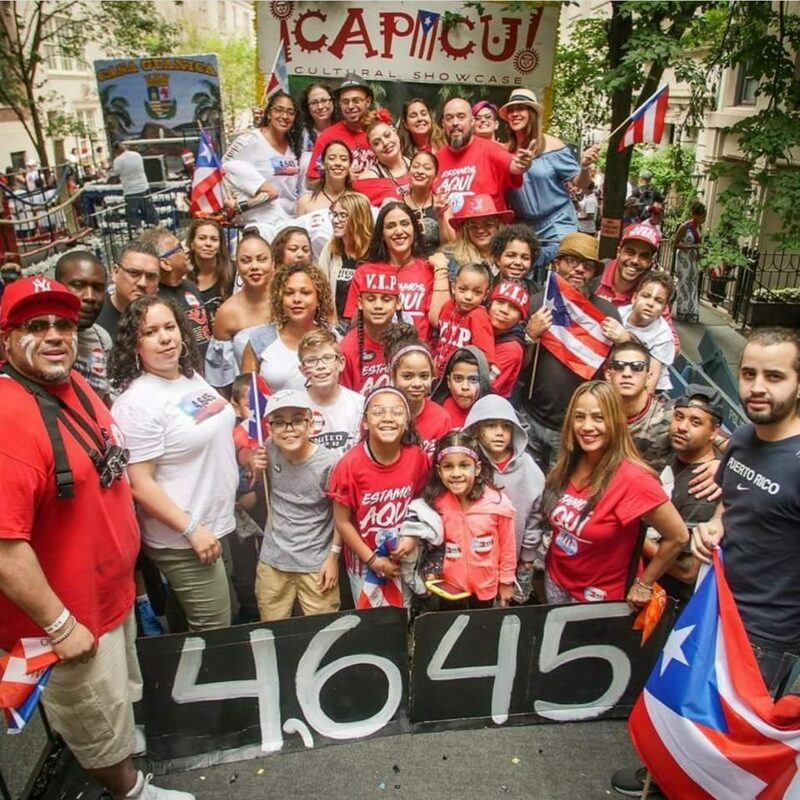 As the Capicu float turned onto Fifth Avenue it was extremely difficult to make our way down the parade route without thinking about what so many of our people have lost; their homes, their belongings, their loved ones, and for some their mental health. For the survivors trying to rebuild, the psychological impact of losing everything isn’t something that is at the forefront of discussions when talking about the Hurricane Maria aftermath. In fact, in an article in The National Geographic Magazine, psychologist Domingo Marqués, said “The storm takes away the foundations of society. Everything you thought gave you certainty is gone. You see people anxious, depressed, scared.” Marqués estimates that 30 to 50 percent of the population is experiencing post-traumatic stress disorder, depression, or anxiety. No one knows what the lasting effects of the hurricane will have on the mental health of survivors. Moreover, a recent Harvard study estimated that 4,645 Puertorriqueños lost their lives as a result of the Hurricane. When you consider the loss of everything you’ve worked your entire life for, coupled with the loss of loved ones the psychological effects can be devastating. And while the number of deaths being reported in the Harvard study are being challenged and may not be an accurate calculation of the total lives lost, neither is the 64 that the U. S. Government has cited as being the official death count. Whatever that number is, the fact remains that 1 too many people lost their lives due to the disregard and slow to action response of this country’s administration. Our chant of four thousand, six hundred, forty-five (Estamos Aqui) was our way of honoring those who perished because of the negligence of this administration.